I really wish I had a better classical education. I wish I knew the top 1000 or so classical music pieces and I wish I knew the great works of art. I will probably never make it but I’ll keep on trying. The news for my kids is better. They have more than a shot. It is almost a guarantee. The primary reason for that – and I know it sounds crazy – is the iPad. I talked last week about the classical art puzzle app that we love. 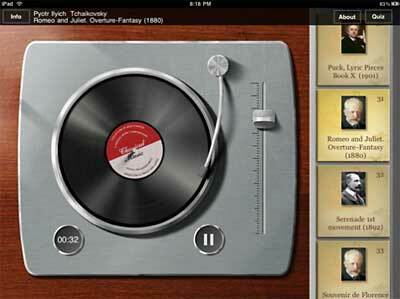 This classical music app is not as good but it is still an incredible buy for $1. It has 50 classical songs, not in their entirety but the first minute or so. After you play around with this for a bit, you can move on to a 50 question classical music quiz. My 5 year-old can get all 50 correct with ease and I just started with my younger son, who is 4, last night. Like many of the best iPad educational apps, this AdsSoftware app is not visually impressive. It is downright unattractive actually. But, ultimately, the question is does your child learn. The answer here is absolutely yes. Classical music is so ubiquitous. I love that my oldest son can hear classical music in movies or in games and know the song and sometimes even something about it. This classical music app is a big reason for this which is why I strongly recommend getting this app.